Identification: This is a dusky cream animal decorated with random brown lines. The notum is covered with moderately long, slender processes. The rhinophores have cup-like lamellae on their posterior faces and brown medial bands. Natural history: Okenia pellucida is a common species on the exposed accretion platform at Maalaea Bay but is rare at other sites. At that site, it occurs at 2-5 m (6-16 ft). 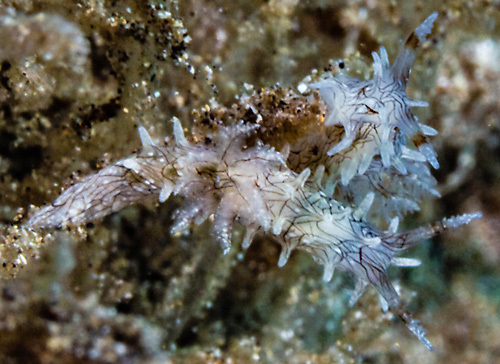 Scott Johnson also found it to be fairly common in a somewhat more protected area at Magic Island, Oahu. It feeds on the bryozoan Zoobotryon sp. (Gosliner, et. al., 2008). It lays an egg mass composed of an irregularly arranged white ribbon that hatches in three to four days in the laboratory. Taxonomic notes: It was probably first reported in Hawaii from Kewalo Basin, Oahu, in Oct., 1963 (Kay & Young, 1969--as Okenia sp.). Photo: PF: Maalaea Bay, Maui; May, 1996.